For me 2018 was the year that mirrorless cameras became enticing. They have been out for a few years now, but with the release of the Sony A7iii - they finally had my attention. Can I be in both camps? Over the years I have been part of many conversations where photographers have 'switched', 'jumped ship', 'gone mirror-less'; accompanied by a phrase such as "Canon/Nikon just aren't innovating enough". It has kind of divided the photographic community in a way, because there used to be the 'big two' camera companies and it was easier to borrow/buy/sell gear. Early adopters to mirrorless felt like they had to justify their purchase, and this then suggested that DSLR's are like old dinosaurs and they will soon be extinct. Us old dogs with the DSLR's will have to surrender to mirrorless when our camera brand stops supporting the existing line up of cameras, our tale between our legs at the counter purchasing a mirrorless camera in 2021. The DSLR shooters sit back and watch with a keen eye as the technology progresses, but it isn't quite matching what I get from my current camera, and what the hell is the battery life all about? I will wait until the price comes down and people stop complaining about things. Then Sony drop an 'affordable', but fully spec'd out professional grade camera, to steal all of the Canon and Nikon users away; before they finally release a proper mirrorless camera. I am a Canon user, and having seen the tech in the Sony A7iii, I am 100% confident that Canon won't deliver on matching what Sony are currently offering any time soon. If they did, they simply wouldn't have much scope to sell you the next model up. Canon have a wonderful way of giving you 90% of the features that you want, but that one feature that could have been added at no real cost, that is an extra or on the next model up. I am also incredibly impatient, and just don't want to wait a year for a camera to come out. It was time to join the waiting list for the latest camera. I have been using the Sony A7iii for three months now, and it is impressive. Fiddly, but impressive. This is the first mirrorless camera I have properly used, although I have held a selection of cameras (testing them out with Gordon Laing of Cameralabs fame). On the topic of Gordon, it is essentially he that sold the camera to me. He had been to the US to test the camera out for Sony, and he said that this is the camera that I have been waiting for. I am a bit of a snob when it comes to sensor size, so if I was ever going to 'go mirrorless' it would have to be full frame, and Sony (up until now) were the only company making them. My biggest issue with buying a non-Canon camera would of course be lenses. So I researched beforehand and found out that I could adapt the lenses I already own and they would work for stills and video. Sony had also fixed the battery issue. I knew that I could expect testing times navigating the Sony menus, but after a few youtube tutorials I have all of my shortcuts set up, so I don't even have to use the menus anymore! My daughter is now 6 years old, and she can use the Sony. The screen on the back tells her what is in focus and whether something is over exposed. She was filming me the other day and she said that the side of my face was stripey, which is the over-exposure zebra stripes that I have switched on. Mirorrless has therefore unlocked the option for novices to use the cameras and avoid technical issues. The EVF is good, and I feel comfortable using it - but it is still not the same as looking through a piece of glass. If someone said, "Ben, I can put screens inside your glasses and you can then view the world digitally" - I would have to opt for no. I shoot manual, so I typically take a few test shots and away I go - nailing the exposure every time after that. Mirrorless cameras do show you the exposure before you take the photo, but in reality you are saving a handful of photos...so I am not sure that is a benefit to me personally. If shooting in manual focus, you have focus peaking, the camera is much quieter and faster than my Canon, it has a touch screen (with annoyingly limited functionality! Thanks Sony! ), and I can charge it on the go from an external battery pack. Dynamic range is something I would choose over resolution, ridiculous frame rates and many other features. So you would expect that a sensor designed in 2018 would out perform the sensor in my Canon 5D mk3 from (as he googles it.......damn is it that old!?!) 2012. I have been taking out both cameras with me lately, to do some real world testing side by side. I have included some of the images here, some in favourable lighting, some in high contrast situations. The settings (shutter speed, aperture, ISO and white balance) are identical in all of the photos, and they are unedited raw files from lightroom. How I set up the images was to choose the settings where the Canon was at the limit of over exposing (shooting to the right of the histogram) and then matched the settings on the Sony. On first inspection the files from the Sony look a bit flat, but that is because the Sony could actually handle a greater exposure. This is evident in the sky where the writing is, there is colour in the Sony images, whereas it is quite difficult to read the 'Canon' writing in the bright sky. Inevitably I had to edit the Sony images a bit harder, breathe some life into the images, but there is more scope to do so. Straight out of camera though, the Canon images look better. As a photographer, you may not hear the phrase 'colour science' as much as you do in the video world, since stills are very easily adapted in Lightroom or your preferred editing suite. But with video, you need to get the footage right-ish in camera. Straight out of the box, the Sony has a look. I filmed a family video on my Canon 80D and the Sony, and edited them into the same final video. The Sony footage looked cold and clinical, and although better quality; was not good for skin tones. The reason that people choose Canon for video is because of their colour science. But luckily some smart bods have dabbled with the Sony settings and sell you the answers to make your Sony look like Canon colours. Now the footage looks great. So what are you going to shoot with from now on? Both. I am not switching, because I am happy with my Canon. The main reason that I purchased the Sony was for video, as its capabilities far exceeds that of my Canon. I was in the market for a full frame camera that has continuous autofocus during capture and shoots at 100 frames per second. Simple request, but Canon's only offering was the 1DX mk2, which sells for £5.5K. The video spec on the Sony is perfect for making video walk-through's of buildings. The Sony is also a low-light beast, I would never use my Canon as such high ISO's, but the Sony just handles it. Back to stills. I haven't ever used my Canon 5d3 for stills and felt that it was lacking anything. The focusing capabilities of the 5D mk2 was questionable, but the mark 3 is great. But you already said that the dynamic range of the Sony was better Ben? Yes, but when I shoot landscapes I go out at an ideal time of day and I use grad filters to iron out any contrast issues with the sky. Its a simple as that. So for landscapes I don't actually need more dynamic range. I could really do with more dynamic range when I am shooting interiors and architecture (because grads are a lot more difficult in this scenario), but I manage with long exposures and studio lighting/flashes. I think that the Sony will be in my camera bag on these occasions. I am in the lucky position that I don't have to choose, and I believe that you pick the right tool for the job. I have primarily been using the Sony for shooting portraits, and the fantastic focusing system and speedy burst rate makes it a pleasure to use. I don't think that the Sony would be my go camera to for a landscape shoot where it might rain, cold weather that is going to quickly drain the battery, timelapses or long exposures that are also going to be demanding on the battery. I would also not feel as confident with the Sony in a situation where I have to quickly react to a changing situation and quickly navigate the settings - this is going to take me a while to build up this muscle memory. I can use my Canon in the dark,I know where all the buttons are with my eyes closed, and it just feels right for me. So, if today's task is to shoot some landscapes and film the journey whilst walking, I would take a Canon with a stabilised wide angle lens, or the DJI Osmo. If I am filming in low light and I don't need a flippy-outy screen, then I will take the Sony. If I am going to get rained on, I will take the Go Pro. That brings me onto the topic of lenses nicely. I have a lovely selection of lenses made by Canon, some of which Sony do not have an equivalent. I use a Canon tilt shift lens for most of my architectural work, this is a manual focus lens anyway. If I were to switch, then I would be seriously out of pocket, considering how much the Sony lenses cost. I have only purchased one Sony lens, the nifty fifty, and it performs very well indeed; but I don't think it is justified to be twice the price of the Canon 50mmm f1.8? I can honestly say that I am happy with the quality of images I am getting out of my Canon set up, so I don't see any gain in selling all my Canon equipment and losing money on new Sony lenses. 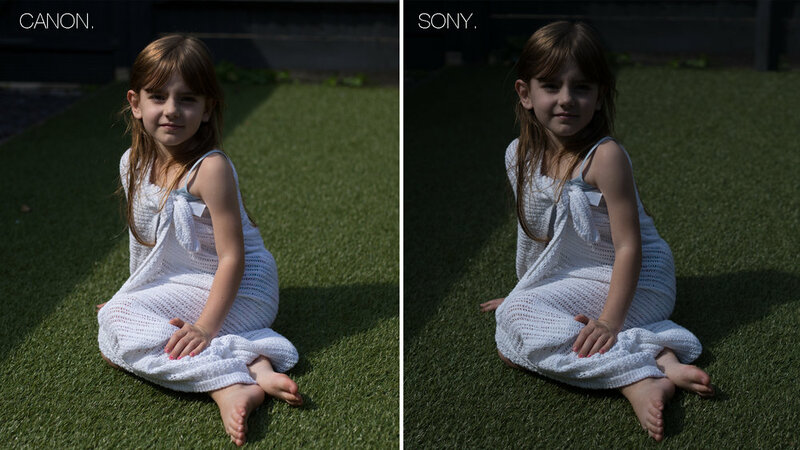 The only reason I bought the Sony 50mm is that it unlocks several focusing features that you lose when adapting lenses. My camera bag usually contains several lenses, a tripod, water, two camera, filters etc. There is no significant weight saving for me if I were to have a mirrorless camera over a DSLR, so this was never a consideration for me. Smaller sensor mirrorless cameras however have a significant weight saving. 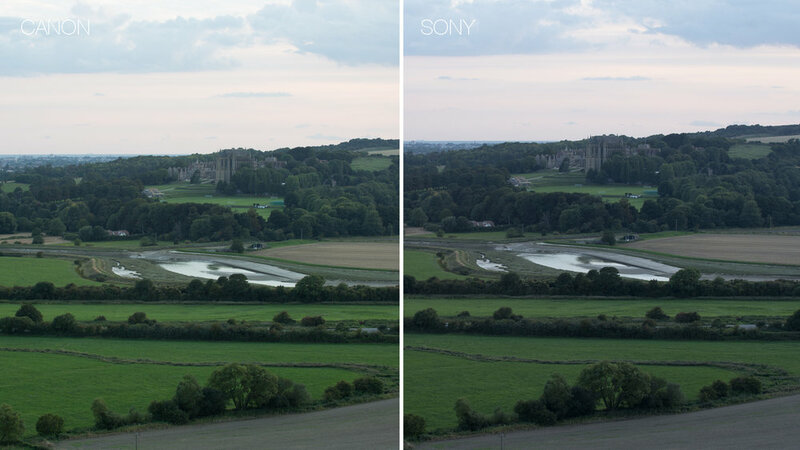 Using the adaptor and putting a reasonable size lens on the Sony doesn't quite look right. aesthetics aside, however well built the Sony is it feels a bit fragile in the hand when compared to a DSLR. After using it for a few hours on one day, I started to develop a claw-type-cramp in my hand from gripping a camera that doesn't quite fit in my hand properly - and I don't have massive hands. Buy a battery grip then Ben, you say, I don't want to spend more money and I don't want to make the camera bigger, it is quite a nifty size as it is. But if you could only take one camera out with you? This is the big question. If I had to go out to create stills and video, then the Sony is the camera I would take. It is capable in all situations, and I can use my Canon lenses on it where necessary. For video, this is where the Sony really shines for me, as it has a super-35 mode that crops in on the sensor, making the 50mm lens a 75mm with no loss of quality for video. When you adapt Canon lenses however you do lose some features - mainly continuous autofocus in video and eye detection in stills mode. Otherwise they adapt well. If you get the Sigma MC-11 adaptor, Sigma lenses retain focus capabilities in video mode. If the screen flipped all the way out, allowing me to film myself for my youtube videos, this would have a permanent place in my camera bag. Should you part with 2 grand if you have a Canon or Nikon full frame DSLR? It depends. How invested are you in your current brand? I am in too deep with Canon, and as I said earlier - I am happy with my Canon gear. I think I have been collecting Canon stuff since 2005, so it would be quite a big decision to swap brands. Don't just buy a mirrorless camera because it is the latest camera technology. Weigh up what benefits it will have over your existing set up. People will not be able to look at your images and tell whether a mirror moved out of the way before you took the shot. It won't make your photography better either! I hope that this was helpful. And if you are interested in the Sony A7iii keep an eye on my youtube channel as I will be putting it through its paces in a whole manner of scenarios.